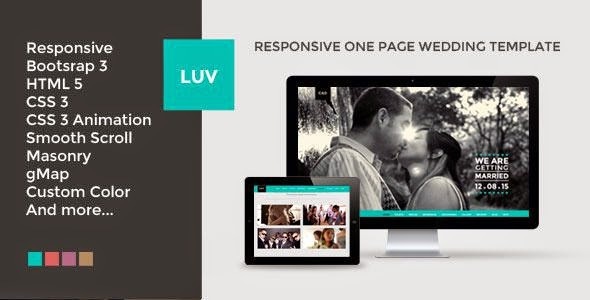 LUV is a responsive one page wedding template. It works for mobile device and desktop. It is clean and simple. Great for wedding invitation and wedding event. This one page Joomla template is powered by Bootstrap that makes it displays beautifully across all devices. The template design is a minimal one with nice simple colors and custom web fonts to match the wedding event. The layout can be easy to modify with drag and drop. The template includes a fancy Polaroid gallery to make the wedding memorable. The RSVP form is built with AJAX to work seamlessly. Item Reviewed: LUV Responsive One Page Wedding Joomla Template 9 out of 10 based on 10 ratings. 9 user reviews.